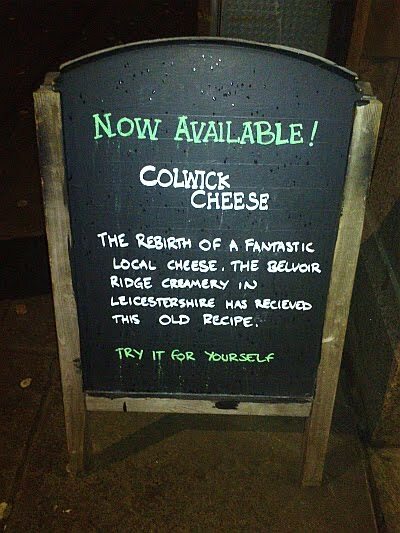 Colwick Cheese has been 'flying off the shelves' since the recipe has revived by the Belvoir Ridge Creamery and featured by Jamie Oliver. The 18th century recipe was invented in Colwick and many Sneinton residents remember it being home made until quite recently in the area. The cheese would have been made with left over milk and eaten fresh- presumably the recipe died out as processed cheeses with a longer shelf life became cheaper and more available. The cheese has a really fresh and light taste- it goes well with honey (think of the Greek style honey and yoghurt combination) or with savoury dishes. It's available from Delilah delicatessen in town. Hopefully, we'll see it on Sneinton Market soon! You can read more about the history of the cheese on the Belvoir Ridge website.